Stream music from your phone straight to your car’s sound system with solid Bluetooth and FM connections. All you need for FM is an unoccupied radio station, and the Roav’s boosted signal and static-cancellation tech will do the rest to provide you a clear way to listen to your favorite tunes. The two USB ports provide simultaneous high-speed charging. You’ll also get echo-cancellation and a stable connection when using the Roav for phone calls. It comes with a one-year warranty. Users give it 4.4 stars based on 456 reviews. 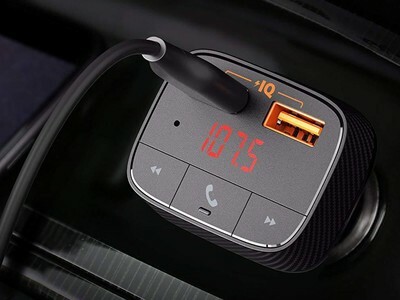 A few cars won’t be compatible with this device, so be sure to check the list on the product page.